TIP: We like Cup 4 Cup here but you can use your favorite all purpose gluten free flour like Bob’s Red Mill or Cloud 9. TIP: We use “100% Whey Protein” which can be purchased at health food and body building stores. Be sure you buy one that’s unflavoured.Again, you can leave out the whey powder. The result may not be as fluffy. Mix water and granulated white sugar together and add yeast. Set aside for at least 5 minutes. Put the next three ingredients in a large bowl and mix well. Make a well in the centre of the dry ingredients and add yeast mixture. Stir well. The dough will be sticky and quite wet. Spread a large sheet of lightly greased parchment paper on your counter. 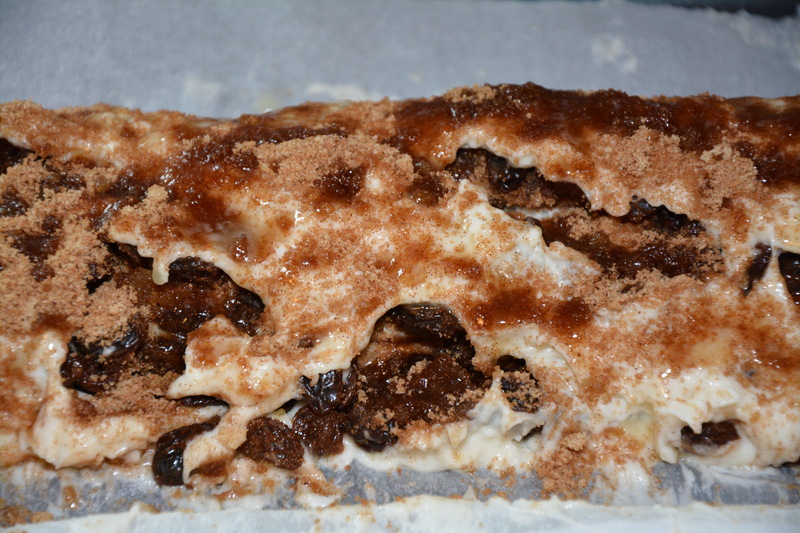 Pour the dough mix onto the parchment and, using a spoon or an icing spreader, spread into a rectangle that is approximately 12 inches x 9 inches. Set the dough in a warm place to rise for 40 minutes. In the meantime, mix together the brown sugar, allspice, cinnamon and nutmeg. When the dough has risen brush it with about half of the melted butter, avoiding the 1/2 inch along the edges of the long sides of the rectangle. Sprinkle the raisins evenly over the buttered area followed by three quarters of the spice and sugar mixture. Gently press into the dough. Now, align your rectangle so that the long sides run parallel to your counter edge. 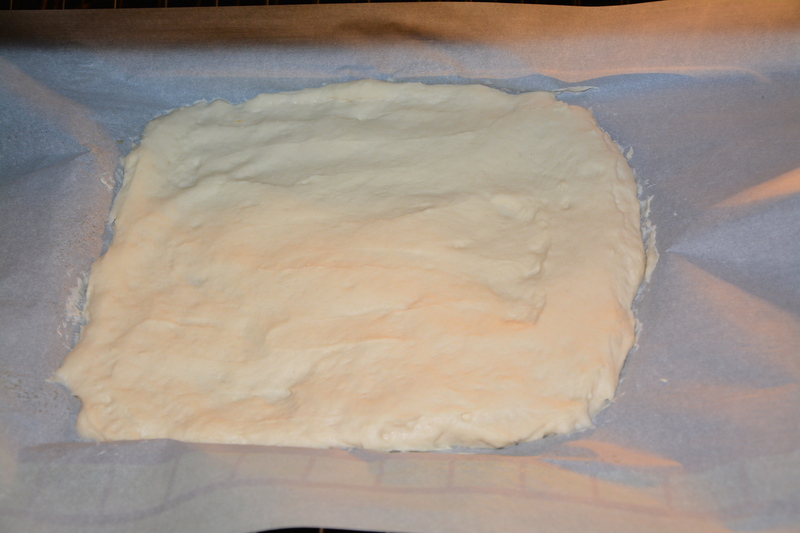 Using the parchment paper as a lifter, begin to gently roll the rectangle on top of itself. The dough may stick to the paper. Use a spatula to gently scrape it away from the parchment. TIP: Do not worry if the dough tears. This is what gives the coffee bread its mottled look. Now again using the parchment as support, lift the ‘cinnamon roll’ onto a cookie sheet. Now sprinkle the roll with the remaining sugar and spice mixture and drizzle with half of what’s left of the melted butter. When you are ready to bake the bread, place the pan including the parchment paper in a preheated 350 degree oven and bake for 25-30 minutes. Remove from the oven and brush the top with the rest of the melted butter. Enjoy! Good warm from the oven but even better when fully cooled. Will last a couple of days in a sealed container. Leftovers can also be wrapped in tinfoil and heated in a 350 degree oven for a few minutes. This entry was posted in Baking, Breakfast & Brunch, Drinks & Desserts, Recipes, Uncategorized and tagged bob's red mill, bread, cup 4 cup flour, gluten free. Bookmark the permalink. sounds yummy, will have to try it soon!